Quality Construction Precisionmachined, closegrained cast iron pump body and base are specially treated to resist corrosion. 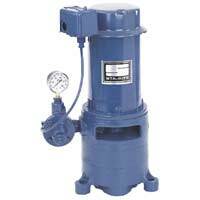 Automatic Pressure Regulator Fasteracting and quieter, design eliminates "hunting" for correct drive pressure. New improved stem and guide are precisely molded to assure efficient, troublefree performance on all deep wells. Motor Windings Superior insulation materials protect against excessive moisture and contaminants to ensure prolonged motor life. Dustproof Cover All electrical components are protected from dirt, dust and insects by a dustproof canopy. Ventilating air cannot contaminate vital switching components. This eliminates the most common cause of motor failure.